SFP+ Direct Attach Copper Cable, also known as Twinax Cable, is an SFP+ cable assembly used in rack connections between servers and switches. It consists of a high speed copper cable and two SFP+ copper modules. The SFP+ copper modules allow hardware manufactures to achieve high port density, configurability and utilization at a very low cost and reduced power budget. Direct Attach Cable assemblies are a high speed, cost-effective alternative to fiber optic cables in 10Gb Ethernet, 8Gb Fibre Channel and InfiniBand applications. They are suitable for short distances, making them ideal for highly cost-effective networking connectivity within a rack and between adjacent racks. They enable hardware OEMs and data center operators to achieve high port density and configurability at a low cost and reduced power requirement. Compufox SFP+ copper cable assemblies meet the industry MSA for signal integrity performance. The cables are hot-removable and hot-insertable: You can remove and replace them without powering off the switch or disrupting switch functions. A cable comprises a low-voltage cable assembly that connects directly into two SFP+ ports, one at each end of the cable. The cables use high-performance integrated duplex serial data links for bidirectional communication and are designed for data rates of up to 10 Gbps. SFP+ Direct Attach Copper Cable assemblies generally have two types which are Passive and Active versions. 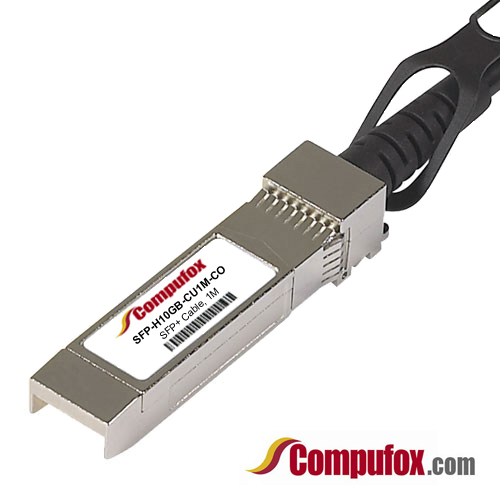 SFP+ passive copper cable assemblies offer high-speed connectivity between active equipment with SFP+ ports. The passive assemblies are compatible with hubs, switches, routers, servers, and network interface cards (NICs) from leading electronics manufacturers like Cisco, Juniper, etc. SFP+ active copper cable assemblies contain low power circuitry in the connector to boost the signal and are driven from the port without additional power requirements. The active version provides a low cost alternative to optical transceivers, and are generally used for end of row or middle of row data center architectures for interconnect distances of up to 15 meters. Compufox SFP+ twinax copper cables are avaliable with custom version and brand compatible version. All of them are 100% compatible with major brands like Cisco, HP, Juniper, Enterasys, Extreme, H3C and so on. If you want to order high quality compatible SFP+ cables and get worldwide delivery, we are your best choice. Q: What are the performance requirements for the cable assembly? A: Our SFP+ copper passive and active cable assemblies meet the signal integrity requirements defined by the industry MSA SFF-8431. We can custom engineer cable assemblies to meet the requirements of a customer’s specific system architecture. Q: Are passive or active cable assemblies required? A: Passive cables have no signal amplification in the assembly and rely on host system Electronic Dispersion Compensation (EDC) for signal amplification/equalization. Active cable assemblies have signal amplification and equalization built into the assembly. Active cable assemblies are typically used in host systems that do not employ EDC. This solution can be a cost savings to the customer. Q: What wire gauge is required? A: We offer SFP+ cable assemblies in wire gauges to support customers' specific cable routing requirements. Smaller wire gauges results in reduced weight, improved airflow and a more flexible cable for ease of routing. Q: What cable lengths are required? A: Cable length and wire gauge are related to the performance characteristics of the cable assembly. Longer cable lengths require heavier wire gauge, while shorter cable lengths can utilize a smaller gauge cable. 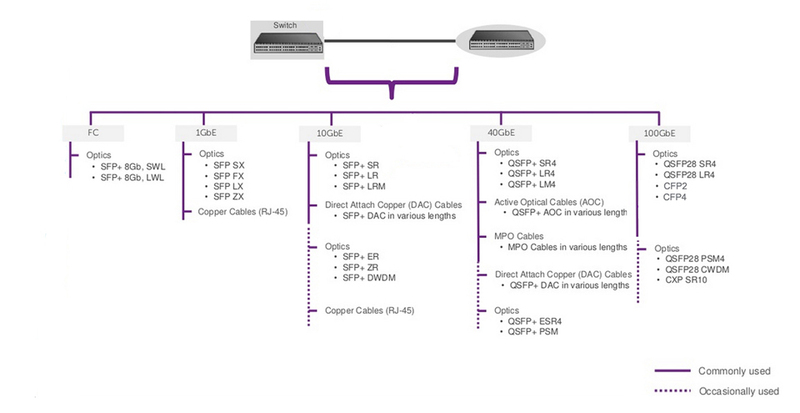 For all you SFP+ Direct attach cables, please see link below. We carry compatible cables for most major brands. 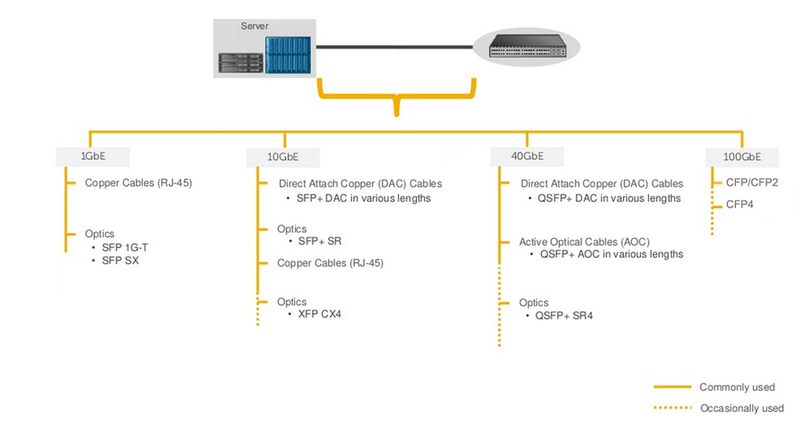 Optics and cables are the most important infrastructures of network connectivity. In a storage area network (SAN), switches are used between servers and storage devices. This means that you should make connection with optics and cables between the server and switch, storage and switch as well as the switch and switch. Of course, according to different application environments, you should choose different optics and cables in order to get the best performance. Furthermore, you may need to consider the future expansion of your network. Thus, an economical and effective solution of optics and cables are very necessary. Firstly, there are some key factors which will influence your decision. Thus, you must make sure that what your network really requires. As we mentioned above, an SAN has server, storage device and switches. So, what should we consider in every section of the network? Bandwidth: Depending on the application load requirements, customers typically decide whether they want 1GbE, 10GbE, or 40GbE. In some cases, the decision may also be dictated by the type of traffic, e.g. DCB (Data center bridging) requires 10GbE or higher.Cost: Servers claim the highest share of devices deployed in any data center. 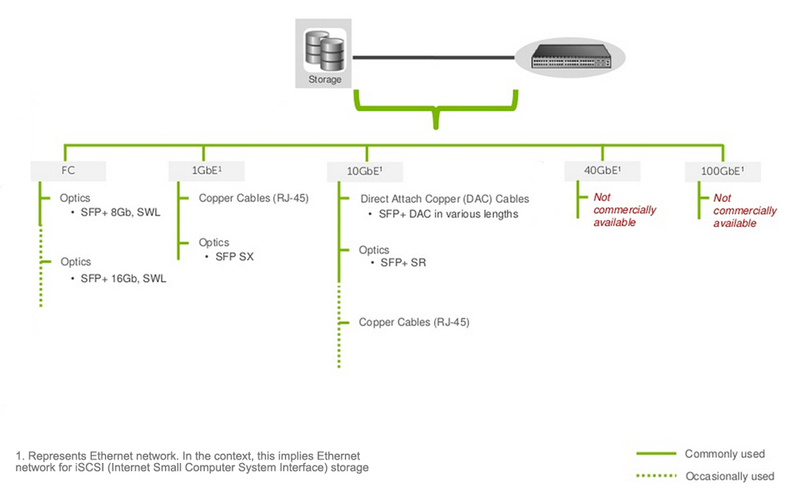 Choosing a lower cost connectivity option results in a much lower initial deployment cost.Power: In any high density server deployment, a connectivity option which consumes lower power results in much lower OpEx.Distance: Servers are typically connected to a switch over a very short distance, i.e. typically within the same rack or, in some cases, within the same row.Cabling Flexibility: Some customer prefer to make their own copper cables due to variable distance requirement. This requirement limits the choice of connectivity to copper cables only. Reliability: Typical storage traffic is very sensitive to loss. Even a minor loss of traffic may result in major impact on application performance.Qualification: Storage vendor qualification or recommendation plays an important role in this decision due to reasons such as customer support, peace of mind, etc.Latency: Any time spent in transition is time taken away from data processing. Reducing transition time results in much faster application performance. The result may have a direct impact on customers' bottom line, e.g. faster processing of online orders. Bandwidth: On server facing ports, servers typically dictate the per port bandwidth requirement. However, per port bandwidth requirement for the network facing (switch-to-switch) ports denpends on multiple factors including amount of traffic generated by the servers, oversubscription ratios, fiber limitations, ect.Distance: An inter-switch or switch to router connection could range from a few inches to tens of kilometers. Generally, the price of optics increases as the distance increases.Latency: The network topology and application traffic profile (East-west, HPC (High Performance Computing), computer cluster, etc.) and influence the minimun latency that can be tolerated in the network.